Here in the halls of Stately Spoilers Manor, we operate pretty much independently.Â So, as I was writing this, I was unaware that Josh was writing a review of the same issue.Â But, seeing as how it’s already written, (and I kind of don’t have time to write another just this instant) I figured, what the heck, why not see how we BOTH felt about the issue, and thenÂ probably never do this again.Â Heh… Â In 1984, or so the story goes, DC Comics was in dire straits.Â The company was bleeding money, very few of their iconic characters seemed very relavant, and there were, apparently, rumors that DC would be no more within months…Â Then, Marv Wolfman and George Perez launched ‘The New Teen Titans,’ a book that took DC’s kid sidekicks, added a dash of X-Men-style plotting, and managed to generate a bona fide classic (and, some say, bringing DC back from the brink. )Â 25 or so years later, those issues are remembered fondly by everyone, and every few years, it is decided that it’s time to get the band back together and see if the Titans can, once again, become the 600 pound gorilla of comics.Â Is Judd Winick the man to reignite the fires of Titan-mania? …and Beast Boy PUNCHES HER IN THE FACE!Â AS A GORILLA! 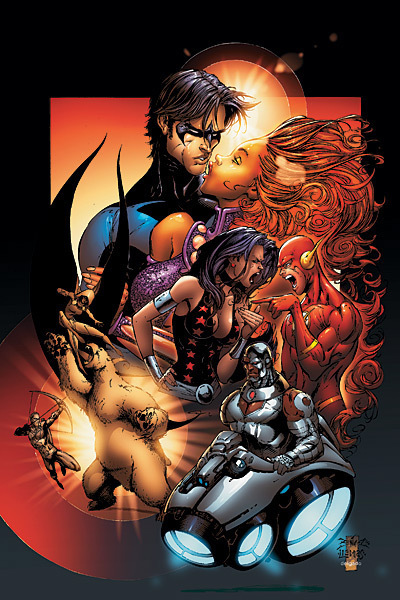 !Â Red Arrow (see above) prepares to skewer them both, buth the rest of the Titans arrive and break it up.Â Donna Troy poses, and her waist is almost exactly the same girth as her upper arm, as she points out that they were all acting out of character…Â The Titans regroup, and compare notes, and Raven realizes that they’ve been attacked by three of the seven deadly sins.Â “Rage.Â Envy.Â Lust.”Â “One for each of us,” says an off-screen voice, andÂ Trigons trio ofÂ four-eyed sons stand before them, poorly drawn and big as life. 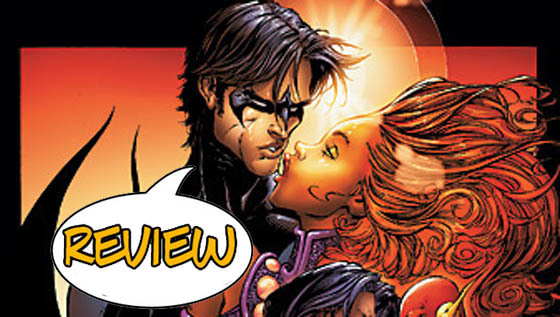 Okay, first, I have to say it.Â I DO NOT LIKE Joe Benitez’ art here.Â All the characters are tall and spindly as Aeon Flux, without the stylization to make it work.Â Worst of all, the one character who should BE tall and gangly, Starfire, isn’t.Â No, she’s shorter than Nightwing, and her curves actually make her look out of place by comparison.Â Joe’s Beast Boy costume is horrid, a mishmash of other uniforms BB has worn before, with short sleeves like a Sears manager in Akron, Ohio, and a shoulder patch that seems to be the footprint of an animal, so long as that animal is shaped like a tear drop and has five claws.Â Cyborg isn’t even in human form here, instead floating around on a strange Liefeld-esque hoverchair, very Professor X circa 1996.Â These are all stylistic choices, yes, but there’s nothing interesting going on with the images, instead reminding me of all the worst aspects of J. Scott Campbell and Erik Larsen…Â I hope that it’ll grow on me.Â (I will say that Benitez draws a mean gorilla.) Even more disappointing to me is the fact that Judd Winick’s script just doesn’t work for me.Â Beast Boy is snide, Red Arrow (Footnote 1.) is pretty much the horndog, but otherwise the character voices all meld together. Judd is usually one of my favorites, so I’m doubly disappointed at how much I don’t like this issue. Trying to revisit the glory days of the Teen Titans is no new feat for DC, but generally, these attempts haven’t been successful in recreating the magic of Wolfman/Perez. I wish Judd and Joe luck with this book, but unless something changes dramatically by issue six (my arbitrary six-month trial period for a book) I’m afraid I won’t be around to see it.Â I can only give this issue 1.5 out of 5 stars. Nightwing becomes more misused everytime his character is forced to regress five years and the Flash belongs in Justice League. If Deathstroke, Terra and/or Brother Blood show up in the next 12 issues…hmm not a good sign. Lightning in a bottle only happens once. I think my impression of this issue was more in line with your review than Josh’s…the art especially is really turning me off. Well, I guess I am the detractor in this conversation. I am enjoying the new series so far. I have always loved the Titans. I loved the first series. I loved the subsequent series. I liked it when it when to graphic paper. I loved it when it was Tales of the Teen Titans. I did not pick it up when the series was Young Justice if that can be counted. I started with the latest incarnation of Teen Titans, but I have become sorely dissapointed. Listen DC. I stopped with Teen Titans. I think that this series can do well. It can do well if the writters recognize that these Titans are no longer teens. They are all adults. Treat them like adults and write them as adults. There are many layers that these characters can be shown. I like this incarnation so far even though it is only three issues. I will keep it up for a while. If i stop I could continue in TPB and save some money. Oh, and I like the art. It is nice to see something different on a main stream book. I stopped reading comics, oh say around the time the Baxter Titan’s series lost Perez’ input….It is sure is swell to be able to pick up the book now and see nothing has changed! I mean it was just as swell to read the old series and see all those old stories and characters from the 1960’s show up and show how . . .nothing.. changed? i’m glad that you and josh both reviewed the same book…. no offense to josh, as he’s “new(er)” to the reviewing game, but THIS is a “fairer” evaluation of the book than his piece. iâ€™m glad that you and josh both reviewed the same bookâ€¦. no offense to josh, as heâ€™s â€œnew(er)â€ to the reviewing game, but THIS is a â€œfairerâ€ evaluation of the book than his piece. Much as I appreciate the compliment, I think it’s just as much a difference in perspective as anything. I’m the old dude, after all, I read New Teen Titans off the stands in 84, I read the Baxter series later, through the revamps, through Team Titans, the ‘Titans’ series that Jay Faerber did with Devin Grayson, even the gawdawful version that Dan Jurgens did that tried so hard to be Wolfman/Perez… I’m conditioned to be harder on relaunches, especially Titans relaunches.